Learn more about the rich history of the Calvary United Methodist Church building and see first-hand how Calvary Center for Culture and Community (CCCC) and other organizations housed here work to improve the quality of life in West Philadelphia. Contributions from tours support CCCC’s building restoration fund and future programs that enhance the quality of life for all West Philadelphians. Renting space for weddings, bar mitzvah’s, private parties, and conferences helps support Calvary. 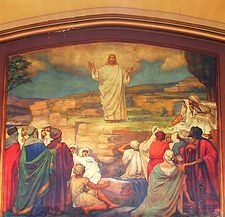 Detail of sanctuary painting, portraying the sermon on the mount, commissioned in 1905. 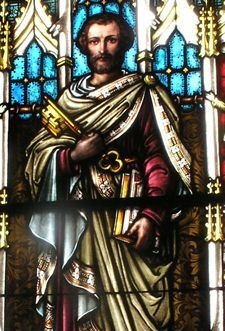 Detail of chapel window, "St. Peter holding the golden keys."